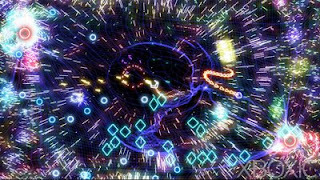 If you are a gamer and you've played the Xbox 360 you've probably played or at least heard of a game called geometry wars. That game has some insane particle effects! More then half of the objects shown in this screenshot are particles. And it looks very cool in motion! Well as some of you might know already, I'm working on a game called Wings of Apocalypse. A little over a month ago,Brian , one of the co-developers (3D Artist) on the project felt that the game looked too plain and we needed some particle effects. I agreed with him and a few thousand keyboard clicks later particle effects were born into my world! Right now we're trying not to show much of what we've done just yet but heres a sneak peak at what the particle effects look like :). And, for all the game coders out there, the following code shows how I define a particle. The code is based on Java's syntax but it shouldn't be too hard to translate it into other languages. If you're using C then you would have to convert this definition class to a 'struct', but if you're using C++ or C# you shoudn't have any trouble converting the code. Yay particles! Nice gif, it repeats well.